Come and join us at M. Browns Spirits and Cocktail Bar. M. Browns is a stylish bar in the Renaissance Hotel (formerly Omni Hotel) that offers classic and specialty cocktails, spirits, beer and wine in an edgy unpretentious setting. Join us for great cocktails and conversation with globally-minded InterNations members! Please make sure that you sign up for the event/cancel if you can't make it. Sign up numbers are given to the venue and help the venue to plan for the event (number of wait staff). For the check in bring cash and have your QR code (which you receive via e-mail after signing up) ready to be scanned when checking in. It will ensure a speedy check in process. Thank you! 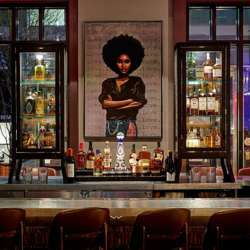 "Developed with the belief that everything gets better with age, M.Brown’s, Spirits and Cocktail Bar promises to be the stylish, relaxed place with an upbeat edge in Old City Philadelphia to go for a drink, where it is all about the enjoyment and the time for pretension has passed. Aging improves beverages, bringing complexity and enhanced flavors. The cocktail and singular brown spirit selection celebrate aged spirits and the multitude of bracing flavors they offer, as do complementing snacks produced through time honored techniques, smoking, curing, pickling, and barbecuing. The service team, whiskey-wise and welcoming, pays attention to detail and encourages you to while away the time; getting better as you do. Sip, savor and enjoy the moment."